It's sometimes hard to truly figure out who is the real star the Met Opera's $16 million Ring Cycle. Is it one of the many operatic stars that grace the productions? I mean, when you have Deborah Voigt (Brünnhilde), Stephanie Blythe (Fricka), Jonas Kaufmann (Siegmund), Bryn Terfel (Wotan), Eric Owens (Alberich), Waltraud Meier (Waltraute) and Jay Hunter Morris (Siegfried) - only to name a few - it's hard to pick out the true star of that group. Perhaps we don't have to. It seems that ever since it was reported that the Met Opera had to reinforce their stage with 65-foot steel girders (a process that involved permanently placing thousands of pounds of steel under the stage) that it was indeed "the machine" that would be the true star of these productions. By "the machine" I mean the 45 ton set of 24 moveable planks on which the four installments of the Cycle - Das Rheingold, Die Walkure, Siegfried and Gotterdammerung - are staged. Since it it first debuted in the 2010-2011 season, the gigantic, creaky, yet technologically advanced, machine has been as temperamental as a pushy diva. The machine has suffered technical misfires and has been blamed for incredibly distracting noises. 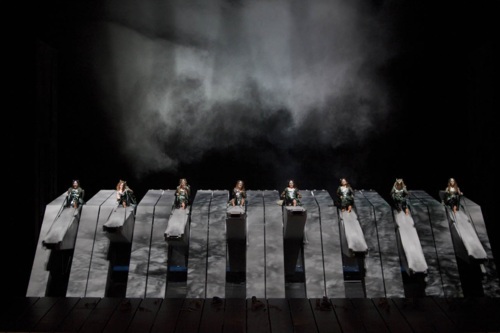 According to several reports on Twitter, Eve Gigliotti, singing the role of Siegrune, fell off the machine, landing in the space between the stage apron underneath the still-moving planks. The audience gasped, and the scene continued with seven Valkyries until Ms. Gigliotti returned to the stage, to a wave of audience applause. Ms. Gigliotti did not take her curtain call at the end of the opera. However, soprano Deborah Voigt, singing the role of Brunnhilde in the production, reported on her Twitter (@debvoigt) that the singer was OK. On her own Twitter account (@evegigliotti) Ms. Gigliotti said that she was "home and resting." This is the second accident in this production involving the set. On opening night, Ms. Voigt was supposed to clamber up the set and hug her father, Wotan (Bryn Terfel) atop the contraption. But she slipped on the set before her opening "Hojotohos" and slid about two feet down to the apron. She picked herself up and sang an admirable set of battle-cries, continuing the performance without missing a beat. The Rhinemaiden descended by a cable to the floor of the Metropolitan Opera stage. She extended her body just in front of a hollow beneath part of the set for Wagner’s Rheingold. Slowly, inexorably, the edge of a 45-ton structure tilted down toward her. “Now!” he added, his voice rising in panic. The Rhinemaiden, a.k.a. Jennifer Johnson, was soon dragged to safety, eliminating the danger of a squashed mezzo-soprano. But the scary moment — really just a bump to be ironed out in early rehearsals, in the eyes of the producers — was a reminder of the risks and hurdles involved in mounting what the Met calls the most complicated production ever put on its stage: a new Wagner “Ring” cycle that involves a leviathan set, scenery almost entirely based on intricate computerized projections and a few age-old theatrical techniques. It is just the sort of thing, its creators say, that Wagner would have wanted: the most advanced technology in service of his opera. Would "the machine" truly be what Wagner would have wanted to be the star of his 16+ hours of music - as opposed to the stars that sing his music? Well, regardless, the Met Opera set out to bring Wagner's dream of a perfect Ring to the stage. And now, you will be able to see the behind-the-scenes action in a new Susan Froemke directed documentary. Froemke followed the Met Opera as it worked on the production over the last four years, documenting the creative processes driving the show, the backstage struggles with the machine, and more. As we know, this is not Froemke's first time at the classical rodeo. Not only did she create films featuring subjects like pianist Vladimir Horowitz and conductor Seiji Ozawa (co-produced with Met general manager Peter Gelb, at the time the head of Sony Classical) but, she also directed the 2009 documentary, The Audition, which went backstage at the Met's National Council Auditions. Wagner's Dream will screen at the TriBeCa Film Festival in New York, which runs from April 18 to April 29. The film will also be in theaters in May, in conjunction with the live HD screenings of the production itself.